Let us know the model(s) of your choice and the destination zip or postal code, along with an email address. Verify and pay the PayPal invoice we email you. Your package is shipped within one business day and you receive a ground shipping tracking number. 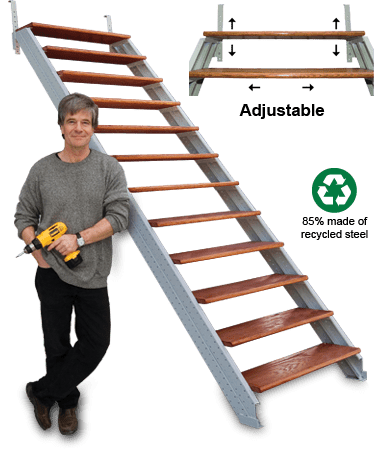 Receive, assemble your stair stringers and install your stairs! All payments, including credit card payments are made through PayPal. (If you’re not familiar with PayPal, it only takes a few minutes to register online when you receive our PayPal invoice at your email address. PayPal gives you two layers of protection: 1. We never know your credit information. 2. PayPal red flags you if dealing with a disreputable vendor).If using a credit card, proceed to PayPal checkout and click on “Checkout as Guest” at Step 1.Canadian customers pay in CDN $ (at $US conversion rate) plus GST (and TVQ/PST in Québec). Should your call not be answered by one of us, we regret that and ask that you leave a detailed message (with order content and zip/postal code) so that we may return your call within one business day for any assistance and/or purchase.